I bought this little dresser at Goodwill downtown Seattle a few weeks ago. I actually liked the way it looked before but it needed some sprucing up. This was my first time using Annie Sloan chalk paint. 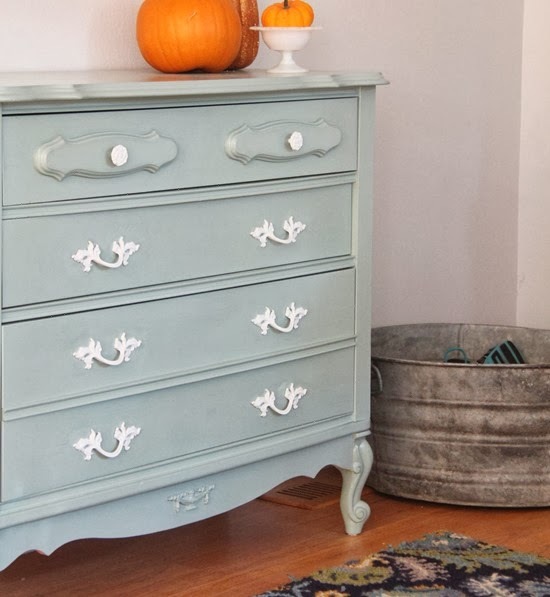 There is a lot of info on the internet about Chalk Paint…but basically you don’t have to sand or prime and it leaves a matte almost chalk-like finish. I love almost everything about this paint. I love the colors it comes in, love that you don’t have to sand, love that there was almost no odor so I could paint inside, love that it went along way…I used maybe 1/4 of the quart on this dresser, and love that it dried fast! I don’t love the price (it’s almost $40 for that quart! ), it’s only in boutique stores, and it really should have a topcoat over it to prevent watermarks/chips. I put a water based polycrylic over the paint to seal it and make it durable…or wax works well too but is more labor intensive. All in all I’m really happy with the result and I’m sure I’ll be using chalk paint a lot more…if only because I don’t have to haul the furniture into the garage and sand/clean/prime it before hand! Not that you asked, but I think you did that dresser a real service by bringing it up to date! And the color you chose matches your background colors here on your website (almost?) perfectly! -Love it! I have been wanting to try painting with chalk paint myself, but have hesitated because of the price of paint. I guess the payoff is in time/energy expended, like you said. :) I've heard that you don't need to use a clear coat, but can wax instead. I'm going to have to break down and give it a try this winter. Thanks for sharing your project! 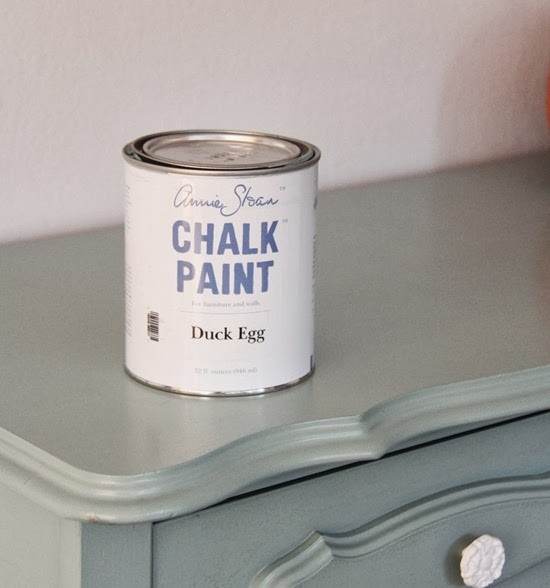 I love the Annie Sloan Chalk paint. I used it on some boxes and baskets in my studio and it is a gorgeous matte finish. Love your dresser, it looks awesome! I love the way the cupboard has come up. I recently painted for the first time using Annie Sloan paint and I love it. I live in Australia and the paint costs me $60 per quart. One tin will paint what I want and it gives me great satisfaction-so worth it I think. I have the matching nightstand, same details and everything. I had to change the hardware because somebody painted it on in lime green. I painted it blue also. Love it! 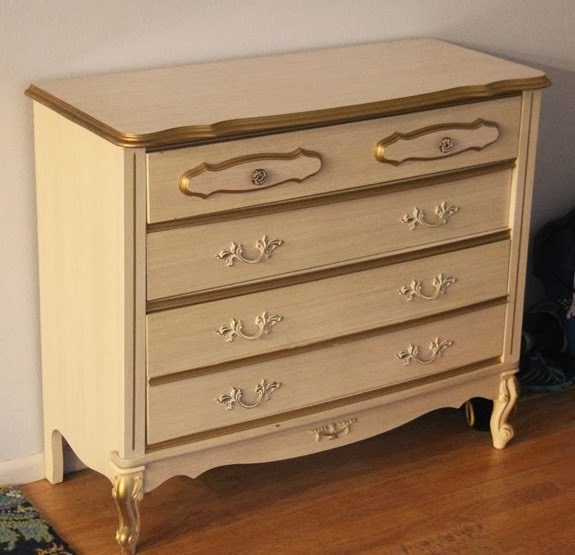 I have this EXACT dresser and just painted it a nice pale, yellow chalk paint :) It was previously painted white and looked pretty nasty (plus it had been in my parents' garage for 20 years) but it's my bedside table now and I love it! Congratulations to the winners. I love your dresser redo. T is gorgeous. You did a great job giving that dresser a new life and I really like the color. Yes, the dresser turned out great. Very pretty! I'm inspired now. I've had some bar stools sitting in my garage for years! I really need to get to them! Have a great day! Congrats to the winners! I have always wanted to try that paint, but I have been deterred by the price. Glad to know it works so well! I have that dresser. Is the top of yours laminated? If so, did you do anything special to prep for painting? Thank you. Absolutely lovely (the colour make me smile) and little red riding hood is pretty cute too!!!! the chalk paint is new to me, love the effect and that it goes straight onto the furniture without preparation, excellent. Die kommode ist schön geworden . Gestrichen und sie sehen wieder zeitgemäß aus . Die entsorgt man nicht, nur weil die Farbe nicht stimmt. Außerdem kaufen beim schwedischen Möbel Markt kann jeder. I just looked into chalk paint this weekend! I love the way it looks, but was wondering how it was to use. Your dresser is wonderful. Love the white hardware. That was my dresser when I was a kid! Wonder how it got all the way to the West coast. It came out beautiful. You'd never ever know it was the same dresser. PERFECT timing! I was contemplating painting two pieces of furniture but … super heavy and you know the rest. I went to the website and found a store near me. Thanks!!! Your dresser/chest looks fab! Go you!! I just bought 2 quarts of AS in light sage green to redo my entire bedroom set, hoping I will like the outdated furniture afterwards. Now i am pumped to "Get 'er done!" :) can't wait to do the before and after pics! Thanks for the inspiration, as always. Your Red Riding Hood is adorable! Love the dresser! Did you get the chalk paint locally (I'm in Seattle, too), and if so, where? Oh, Duck Egg! My favorite of all the Annie Sloan paints. So much fun to take something you like and create something you love! Time to fill it with fabric now, right? Your precious little REd Riding Hood is so sweet. Love what you/she did for her Hallooweenie Day. And your dresser turned out great!! My granny had a set like that which I thought was gaudy!! If only I'd known that a little paint would have made it look so good!! And your sweet little girl is growing so fast before our eyes!! So cute as Little Red Riding Hood!! 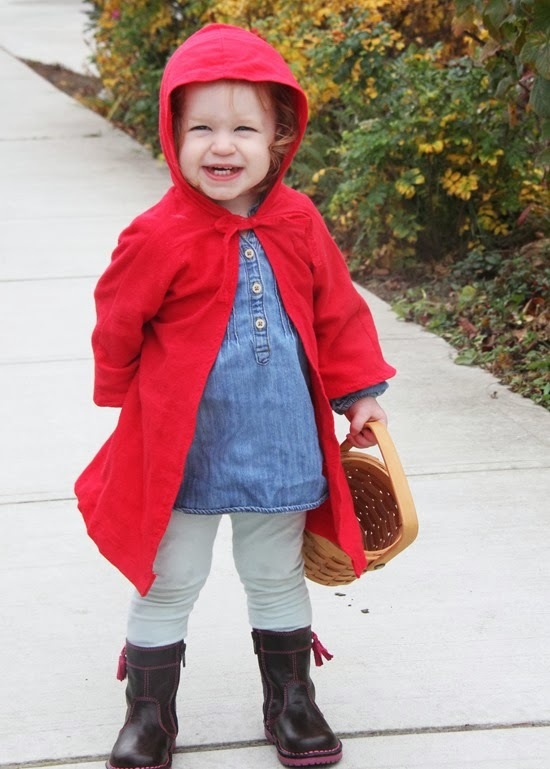 Little Red Riding Hood is just too cute! Love the dresser–great color. I painted the woodwork in my DR with faux milk paint (from ReStore), from a company that went out of business. I love it. It sounds like it is quite similar to chalk paint. But, the can warned that it isn't very durable, and it's such a tiny room, I figured I needed a topcoat. I used Mod Podge Hardcoat. It seems to work very well. Alas, I lose the nice matte finish of the paint, but I like the deep color, even with a shiny coating. It's interesting to read your opinions of AS Chalk Paint. I just love this color Allison. I think it is so pretty, and what a great job you did!! This is my favorite one. While white is simple and makes a statment, this aqua shouts "look at me!" Thanks for the info on the paint. Lovely! You have wonderful ideas. Your little red riding hood is precious . Thanks for sharing. Tu tocador ha quedado maravilloso, felicitaciones. Gorgeous dresser but even prettier daughter! 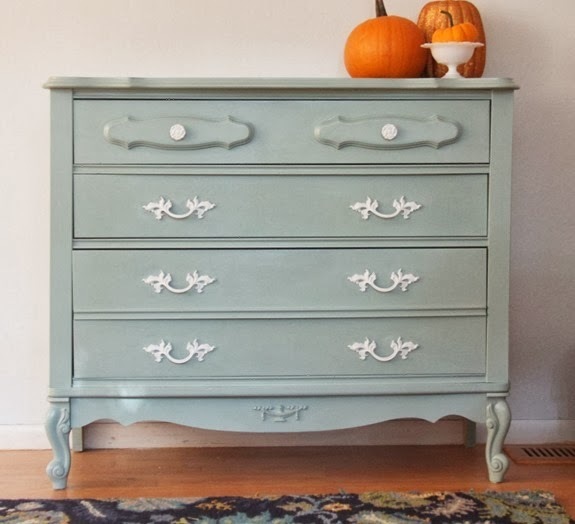 Beautiful dresser…love the color choice! How funny, I bought that exact dresser for my daughter at the Goodwill in Tacoma. there's a place by my work that sells this stuff but they sell a wax to protect it. it's not mat anymore, but it's protected. just something to look into!